Prof. Gonçalves is Founder and Director of the Master in Humanitarian Logistics and Management (MASHLM) and Master in Humanitarian Operations and Supply Chain Management (MASHOM), and Professor of Management at USI. He is also a Research Affiliate at the MIT Sloan School of Management. He holds a Ph.D. in Management Science from MIT Sloan and a M.Sc. from MIT. Prior to USI, Prof. Gonçalves held appointments at the MIT Sloan School of Management and the University of Miami Graduate School of Business. While at Sloan, Paulo worked with Intel’s Strategic Capacity group as an Intel scholar. For his work, he received the Intel Foundation Graduate Research Fellowship Award (2003-2004). For his dissertation, he won the 2004 Doctoral dissertation award given annually by the Council of Supply Chain Management Professionals (CSCMP). 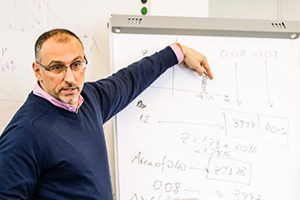 His research combines experiments, simulation, optimization, econometrics, and non-linear dynamics to understand how managers make strategic, tactical and operational decisions in humanitarian settings. Currently, he has been developing supply chain experiments to understand and improve managerial decisions in humanitarian operations. Paulo is also the Co-founder and Chief Strategy & Operations Officer (CSO/COO) of SwissLeg an affordable high-mobility prosthetic social enterprise that aims to restore mobility to the most destitute amputees in the world. Paulo Gonçalves teaches Project Development, Optimization Models, and Process Management & Lean Six Sigma at MASHLM.